Introducing British Standard, creators of an affordable range of ready made kitchen cupboards. All of the British Standard cupboards are offered in a tasteful shaker style and prepared in broken white egg-shell undercoat, so that consumers can paint their cupboards in a colour of their choice. For example, combine smart brown leather with almond hues and raw steel handles for a timeless look. Next has launched a new collection of fitted kitchens in affiliation with Betta Living, who will provide the furnishings and fitting service for Next customers. 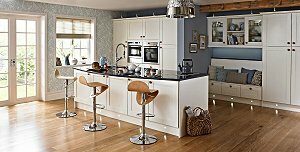 There is a choice of over 50 classic and contemporary kitchens in a selection of wood finishes and colours, which can be viewed by Next customers on a brand new website. Featured here is the Betta Living Warminster Smaller range. 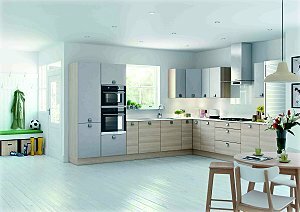 Mereway Kitchens have launched Light Ash, an eye-catching new Spring door style for their Cucina Colore contemporary kitchen collection, in response to the current inclination toward a Scandinavian appearance. This brand new door is completed in a fine horizontal woodgrain textured matt MFC, with matching ABS high quality edging. Light Ash offers wide planning flexibility, as the new door design sits on the normal Mereway cabinet template; it also boasts an exciting variety of components, as well as an appropriate colour co-ordinated MFC cabinet. ALNO, a European leader in glass fronted kitchens, has launched a sumptuous, trendy purple shade to its popular Vetrina high-gloss range. 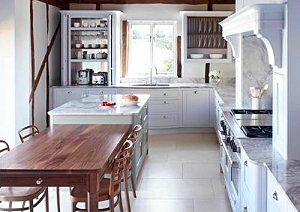 The current fashion for purple kitchens is stimulated by the growth in open plan and homeowners preference for a central hub, to enable them to converse while cooking in the home. 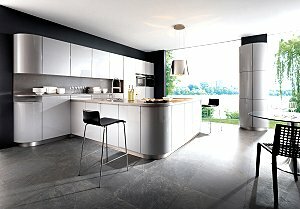 Schüller’s New Gala Kitchen Range With Curve Appeal. The pioneering German kitchen manufacturer Schüller has introduced the eye-catching new Gala curves range, in response to curved kitchens becoming a popular trend in 2012. Schüller’s new Gala Design collection offers wall to wall curves, a multitude of cabinet heights, depths and widths and over 250 door fronts, to enable some really inspired planning. With so many options, the Gala collection brings added luxury into inexpensive kitchen ranges. The Furniture Barn Presents Two New Collections At Grand Designs Live. 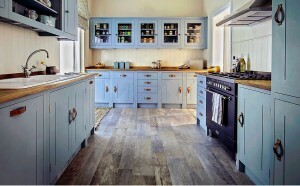 Visitors of Grand Designs Live at Excel London from 5th – 13th May 2012, will be able to view two marvelous collections presented by The Furniture Barn, including the newly launched Vintage Range and the Country Kitchen. 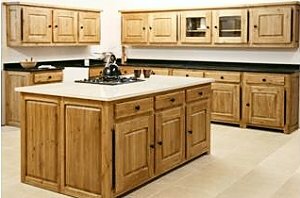 The Vintage Range is an ideal size for the larger house; the hand finish and light oiling, really brings out the beautiful natural colour of the oak whilst also protecting the pieces. Underwood Furniture, one of Britain’s leading bespoke furniture-makers has launched a new website. The new website showcases Underwood’s cheerful and contemporary stance on kitchens; their classic designs are as much at home in lively urban settings as in more rural areas of the country. The Kitchen Dresser Company’s Furniture Is Hand-Crafted in England. 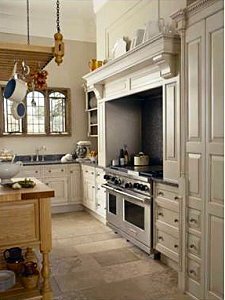 The Kitchen Dresser Company creates bespoke furniture that is as beautiful as it is practical, using traditional skills, which is nice to know, since nowadays so many are criticizing the decline in our time-honoured British industries. 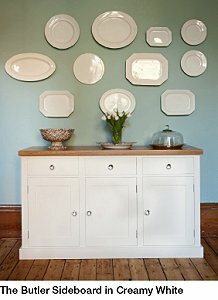 As specialists in the design and construction of fine kitchen furniture, The Kitchen Dresser Company uses only the highest quality materials, while employing long-established cabinet-making skills: The collections of furniture from this family run company, have evolved from a simple dresser to include a range of truly individual, custom pieces. Every item is timeless, pleasing to the eye and distinctive and made by hand by craftsmen right here in England, in traditional Victorian workshops in the heart of the historic Staffordshire Potteries. Each piece is worked on by a single craftsman, using dovetail and tenon joints, to ensure solid furniture that is a delight to live with and sturdy enough to withstand constant daily use. The range comprises Kitchen Dressers, Sideboards, Tables and Chairs, Worktops and The Morning Room – a collection of refined yet modest furniture ideally suited for reception rooms. Featured here is the creamy white Butler Sideboard, which will hold almost everything needed to set your table for a special lunch or supper. Priced from £2295. Furniture in the collections is available in a range of natural paint colours, from Old White and Butter, through to Sage and Rosehip Red, as well as any other designer colour of your choice. Margaret Thatcher’s Dulwich house was fitted with a handmade Smallbone kitchen, which had won the Prime Minister’s heart at first sight and in 1985 was one of the most widely reported features about her home. As a Smallbone Kitchen owner, she joined the ranks of celebrity fans of the company, which included Rowan Atkinson, Nigel Mansell and Dustin Hoffman. Today, the company is still known for its international star following. As a direct result of this media coverage, Mrs. Thatcher’s Dulwich kitchen was carefully recreated at Pinewood Studios for the set of The Iron Lady film, now released. 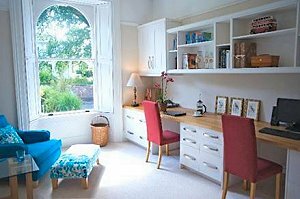 Bespoke Home Offices – New From Barnes Of Ashburton. Barnes of Ashburton are celebrated for their designs in hand-crafted bespoke kitchens, but in response to the increasing numbers of people choosing to work from home, they have entered the market for home offices. If space is at a premium and converting a box room or garage isn’t an option, then a home office space can easily be created within your living room.